Play It! can fire children up with enthusiasm for music! ‘I work right in the moment. I play with children, responding to what they are interested in: I trust my instincts about what feels right to do – when to sing with them, when to simply watch and appreciate, when to be silly, when to join in and sing about what they are doing, when to introduce a different song, when to make a suggestion, when to be silent. 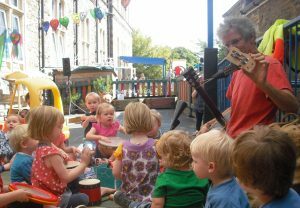 I believe that the aims of all the well thought out developmental goals and targets will be best met by meeting children in their experience in the moment, validating, encouraging and joining in with their world, which for me is through music. Recent news: View the write up of recent work at Knowle West Children’s Centre with Bill here. The research question was ‘can a music project build social and cultural capital? 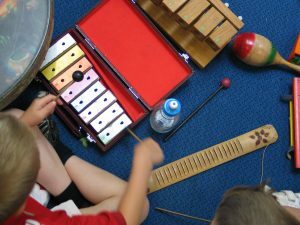 Music In The Forest project has come to an end: we’ve worked with settings across Bristol and developed new work outdoors, both in school grounds and off-site in forest locations. The training day in Autumn 2015 passed skills on to practitioners more widely, and a booklet is in the pipeline. Mood Music is continuing, and we ran two introductory training mornings this year, and there will be more training opportunities. Get in touch if you’d like any form of Mood Music in your school. Whether you need short term input for a music week, weekly sessions over a half term, fresh ideas for early years, or training for staff to develop confidence and skills, we can provide it! Look at our projects pages to find out about the range of work we offer. We have 3 children’s CDs for sale online here, with audio extracts to listen to. If you have any others needs or queries, contact us.